I started Mountain biking in the summer of 1992. I had just rented a mountain bike because I was a little bored and it opened a new world for me to explore. I rode so much I soon needed to learn the skills to fix and maintain my bike. It took me a few years to become a maniac and I’ve come to enjoy it. I started road biking 6 years ago and although mountain biking will always be my passion I do enjoy the variety the road bike gives me.Enrico and I have recently begun our sea kayak instructor training (Level 1). I enjoy exploring for new trails but I will always know and love Sardinia the most. I rode in Piemonte and Tuscany for 8 years, and also spent time in Ligury and the Dolomites. The Lake Garda Area is great for riding and I know it well. My favourite places to ride are Ogliastra, in Sardinia and around Lake Garda. The Ogliastra tour is my favourite! A 6 day tour riding into the real wild from the Dolomites to Garda. 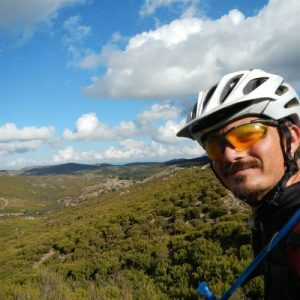 I have a lot of experience in leading both road and mountain bike tours. I enjoy meeting new people and being a guide allows me to do this. Sometimes we become good friends and it makes me feel more enriched day by day!